CGI Continues Its Support For Hindsbury’s ‘Speak Off’ Competition – PVH Group Inc.
Bridgetown — Consumers’ Guarantee Insurance Co. Limited (CGI) has again shown its support for the development of Barbadian youth by donating the first prize of a tablet to the lucky winner of the Hindsbury Primary School’s ‘Speak Off’ competition. As part of the school’s annual ‘Literacy Week’, the students at Hindsbury are encouraged to showcase their writing, comprehension, and public speaking skills in a competition designed to encourage them to appreciate and understand the value of literacy. 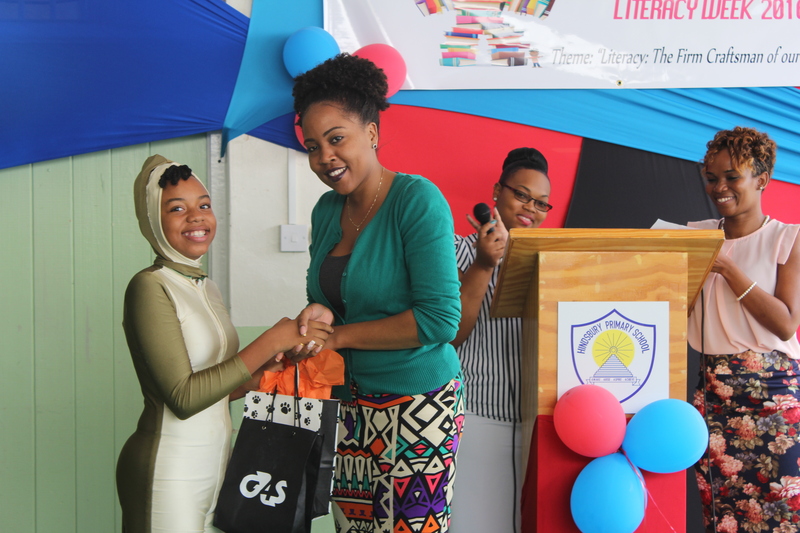 Karla Yearwood, CGI Marketing Representative, presented the first prize to an overjoyed Abigail Roach. Wearing a full body costume to complement her ‘A Day in the Life of A Green Monkey’ piece, Abigail excitedly danced onto the stage to claim her prize. Yearwood said CGI was proud to be again involved in Hindsbury’s ‘Speak Off’ competition for the third successive year. “It’s always such a pleasure for us to be able to support community initiatives, especially when it involves children. CGI has a strong philosophy of giving back to our community, and it is with great pride that we donate this prize to help encourage the future of our nation to excel in their literacy skills”, she said. Hindsbury Primary School Principal Nola Cummings-Lewis said the Literacy Week initiative would not be possible without her dedicated team of passionate teachers who rally together each year to ensure everything comes together and is fun for all. “Here at Hindsbury, we truly believe in the vital importance of literacy, and we want to instill this in our younger generation. And, in the year of our 50th anniversary of Independence, we wanted to especially encourage our students to continue in the footsteps of our forefathers and strive for the highest standards of literacy”, she said. Cummings-Lewis’ sentiments are echoed by this year’s Literacy Week theme, ‘Literacy: The Firm Craftsman of Our Fate’. The ‘Speak Off’ competition was one of many activities designed to encourage the students to continue to read in their everyday life. Other activities included singing jingles, a talent competition, and a special performance by the Police Force band. The other ‘Speak Off’ prize winners were Avornique Wiggins (second place), with her ‘History About Barbie’ and Asha Scott (third place) with ‘A Bajan Tale of A Cinderella Story’. All 18 participating students were awarded a trophy and certificate for their enthusiasm and contribution. Now in its fifth year, Hindsbury Primary School’s Literacy Week is an annual event that both students and teachers look forward to which brings fun and creativity to the school curriculum.